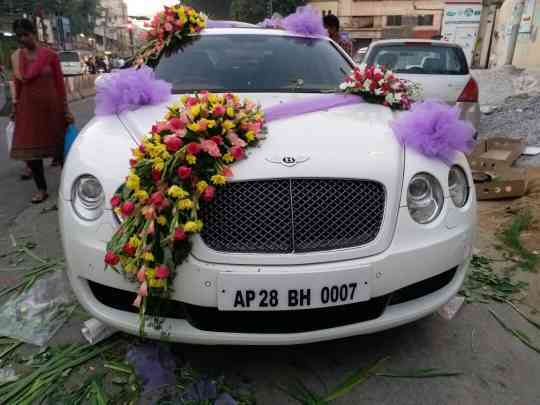 Indians love spending big money on weddings, so much so that multi-crore Rolls Royces are now commonplace as ‘wedding cars’ here. 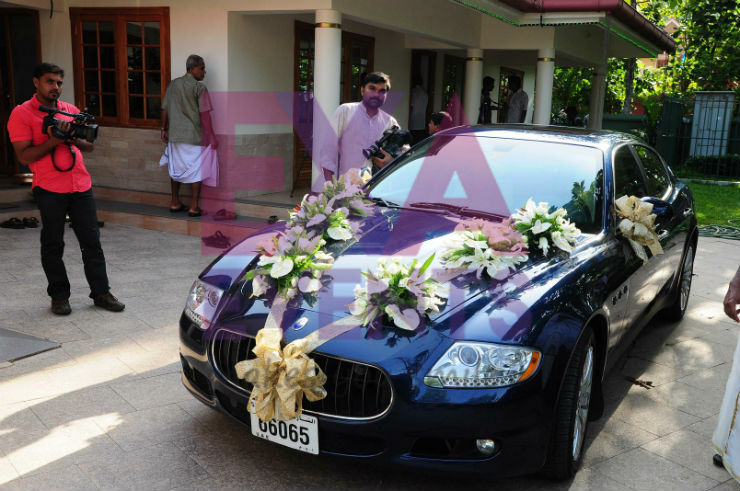 Here are 10 such ‘wedding cars’. From insanely expensive to totally wild, this list has it all. The DHC is a very special car. Not only is it the flagship model in the Rolls Royce range, it also happens to be the most expensive car on sale in India today. 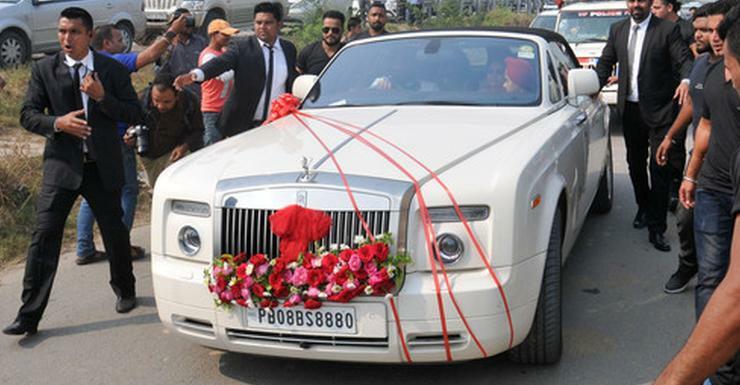 This particular DHC was used in the wedding of famous cricketer Harbhajan Singh. The DHC is powered by a 6.75 liter V12 petrol engine which produces a massive 453 Bhp and 720 Nm. This is one vehicle that is totally baller. 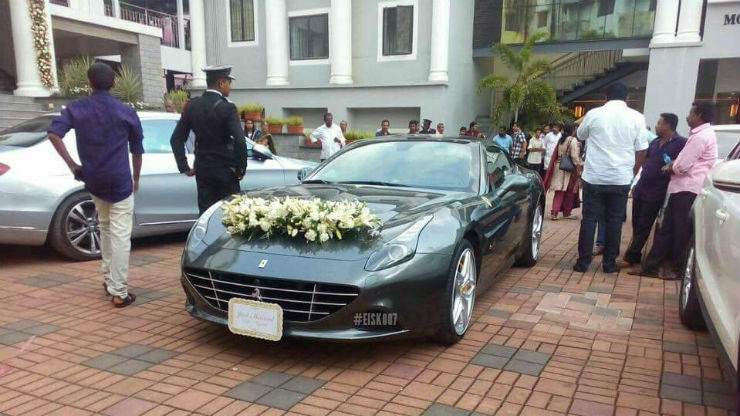 The Ambani family recently picked one up too. 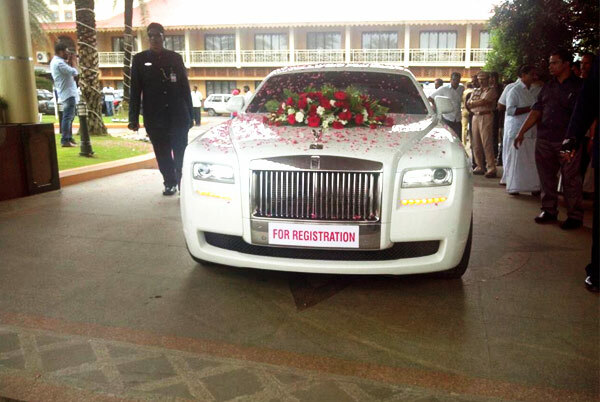 The Ghost, which is the baby Rolls Royce has gotten quite popular lately. With the Ghost, the company saw a massive rise in sales due to the car being more affordable, smaller and yet having the same prestige and comfort, that you expect from a Rolls. The other advantage being the Ghost is actually dynamically involving too, when you drive it hard, something that most Rolls owners would never do. The Flying Spur happens to be the sedan version of the GT. It is not the company’s flagship product, however it offers similar levels of comfort and luxury. This one, is the previous generation vehicle. Power comes from a massive 6.0 liter W12 petrol engine that produces 551 Bhp and 649 Nm. The California T is Ferrari’s entry level product. It has a 2-door hard top convertible, which has recently been upgraded. It now comes with a 3.9 liter turbo petrol engine, as opposed to the naturally aspirated engine which was previously on offer. The engine produces 553 Bhp and 755 Nm. This one also marks the return to the turbocharging era for Ferrari. The Quattroporte is Maserati’s flagship sedan. The vehicle has always been seen as a sporty and luxurious vehicle, offering the best mix of both. Those who want to stand out and have a unique ride opt for something like this or the Panamera, since they are a lot of fun to drive as well. Power comes from either a 4.2 liter V8 or a 4.7 liter V8, based on the variant chosen. While this car was on sale officially, this one here was brought in through CARNET.